David Lynch’s Dune (1984) is the film that science fiction—and the director’s most ardent fans—can neither forgive nor forget. Frank Herbert’s original 1965 novel built a meticulous universe of dark majesty and justice, as wild-eyed freedom fighters and relentless authoritarians all struggled for control of the desert planet Arrakis and its mystical, life-extending “spice.” After several attempts to produce a film, Italian movie mogul Dino De Laurentiis and his producer daughter Raffaella would enlist David Lynch, whose Eraserhead (1977) and The Elephant Man (1980) had already marked him out as a visionary director. What emerges out of their strange, long process is a deeply unique vision of the distant future; an eclectic bazaar of wood-turned spaceship interiors, spitting tyrants, and dream montages. Lynch’s film was “steeped in an ancient primordial nastiness that has nothing to do with the sci-fi film as we currently know it,” as Village Voice critic J. Hoberman put it—only with time becoming a cult classic. 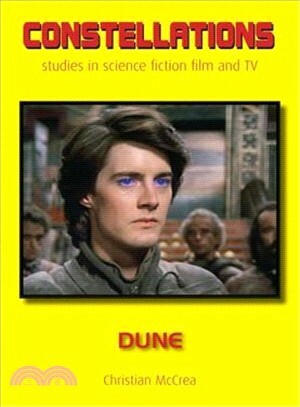 This book is the first long-form critical study of the film; it delves into the relationship with the novel, the rapidly changing context of early 1980s science fiction, and takes a close look at Lynch’s attempt to breathe sincerity and mysticism into a blockbuster movie format that was shifting radically around him. Christian McCrea is a researcher writing on science fiction, film, videogames, animation, and the popular digital arts. He is a lecturer in the School of Design at RMIT University, Melbourne, Australia.